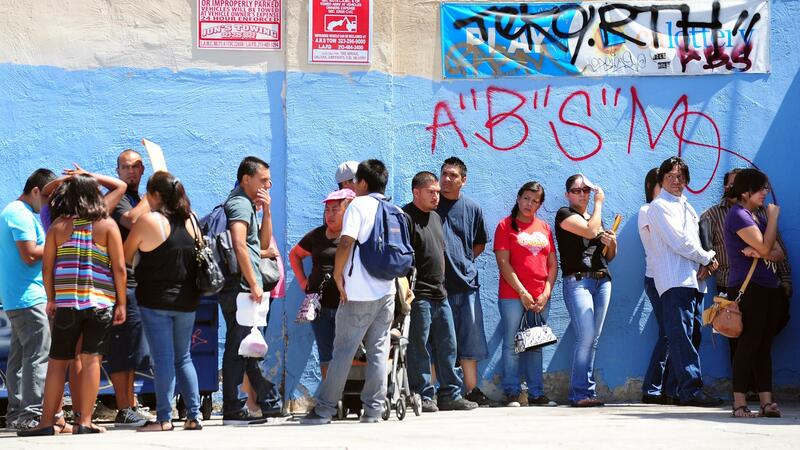 Young people wait in line to enter the Coalition for Humane Immigrant Rights of Los Angeles office on the first day of the Deferred Action for Childhood Arrivals program in August. Still, of the estimated 1.7 million undocumented youths who are believed to be eligible, more than a million have yet to apply for deferred action. Marlen Florentino, 23, just submitted her application in March. Unemployed and raising two young sons, she decided to first enroll in a GED program at a community college near her home in Reston, Va., in order to meet education requirements. Florentino admits she was wary of applying for deferred action when she first heard about the program. After seeing her cousins apply without repercussions on their undocumented family members, she decided it was finally safe to acknowledge to the federal government that her family illegally brought her to the U.S. from Mexico when she was 8 years old. A former hotel housekeeper, Florentino hopes that receiving deferred action status, along with the accompanying work permit, will ultimately lead to a better job. "Not having any type of documents or anything like that, you don't get paid as much. Sometimes you can't even find a job," she says. Deferred Action for Childhood Arrivals, also known as DACA, was created through executive action by President Obama last year, partly in response to the failure to get immigration reform through Congress during his first term. More than a quarter of a million immigrants ages 15 to 30 have been approved for deferred action since the program began last August, according to the latest figures from U.S. Citizenship and Immigration Services. Another 200,000 or so have applied and are waiting for the government's response. Laura Lichter, president of the American Immigration Lawyers Association, says it's important to remember that deferred action is not a path toward citizenship or even a green card under current law. "In essence, you're asking the government for a favor," Lichter says. In other words, deferred action is a way for undocumented youths to ask the government for a pass from deportation because they arrived in the U.S. illegally as children and have not been convicted of any major crimes. "With 11 million people in the country without status, the government needs to prioritize where it's spending its enforcement dollars," says Lichter, who adds that in a way, applicants for deferred action are doing a favor for the government, too. Still, opponents of deferred action have criticized the Obama administration for bypassing Congress to enact the policy. At Monday's Senate Judiciary Committee hearing on immigration reform, Kris Kobach, the Republican secretary of state for Kansas and a former immigration policy adviser to Mitt Romney's presidential campaign, expressed concern over offering special alternatives to undocumented youths. "We are not supposed to punish the children for the sins of the parents. But similarly, we probably shouldn't reward the children for the sins of the parents," Kobach said. So far, the majority of eligible undocumented youths have yet to apply for deferred action. Coming up with the $465 fee to pay for the work permit and fingerprinting requirements might be an obstacle for many, not to mention the difficulty for applicants with interrupted schooling of compiling documents that prove continuous residence in the U.S. since 2007. For some, even filling out the application form can be hard. Lichter says seemingly straightforward questions such as "When did you come into the U.S.?" and "How did you come in?" may be difficult to answer for deferred action applicants who were too young to remember. Still, Lichter sees the deferred action program as a clear success. Less clear is what's ahead in the immigration reform debate in Congress. In the meantime, Lichter says, her immigrant clients are watching and waiting. "People are excited about the possibility for immigration reform," she explains, "but they're not naive." Better the bird in hand, Lichter says, and for many undocumented youth, that's still deferred action. Nearly a half million young people who are in the United States illegally have now applied for Deferred Action. That's a program begun by the Obama administration last year. It's for people who were brought into the United States illegally as children. Those who are approved gain the right to work or study and avoid deportation for two years. Hansi Lo Wang of NPR's Code Switch team has the story of some who've applied. HANSI LO WANG, BYLINE: It's dinnertime at Marlen Florentino's home as she pulls out a dish of fish fillets from the oven. MARLEN FLORENTINO: We're having fish with spaghetti and a little bit of salad and beans. WANG: All in large bowls and platters. It's not every night she gets to share a big meal with her parents, her five brothers and sisters and her two young sons. They live together in their rented home in Virginia, just outside of Washington, D.C. Most weeknights, Florentino, who's 23, is at the local community college studying for her GED. Last month, Florentino took another big step in her life. She acknowledged to the federal government that her family illegally brought her to this country from Mexico when she was 8 years old, and she applied for Deferred Action for Childhood Arrivals. FLORENTINO: The main reason, so we can get a better job. And not, you know, having any type of documents or anything like that, you don't get paid as much. Sometimes, you can't even find a job. WANG: A challenge that Florentino hopes to overcome if the government grants her deferred action for two years and issues her a work permit. LAURA LICHTER: In essence, you're asking the government for a favor. WANG: Laura Lichter is the president of the American Immigration Lawyers Association. She says it's important to remember that deferred action is not a path towards citizenship or even a green card under current law. Rather, deferred action is a way for undocumented youth to ask the government for a pass because they arrived in the U.S. illegally as children and haven't been convicted of any major crimes. LICHTER: With 11 million people in the country without status, the government needs to prioritize where it's spending its enforcement dollars. WANG: Lichter adds, in a way, applicants for deferred action are doing a favor for the government too. Lichter spoke at the Senate Judiciary Committee hearing on immigration reform yesterday, and the speaker that followed her, Kris Kobach, the secretary of state of Kansas, took a different stance. KRIS KOBACH: We are not supposed to punish the children for the sins of the parents, but similarly, we probably shouldn't reward the children for the sins of the parents. WANG: Deferred action was signed into effect by executive order from President Obama last year, partly in response to the failure to get immigration reform through Congress during his first term. So far, more than a quarter of a million immigrants aged 15 through 30 have been approved for deferred action since the program began last year. Another 200,000 have applied and are waiting for the government's response. That still leaves more than a million undocumented immigrants who are believed to be eligible and have yet to apply. Coming up with the $465 to pay for the work permit and fingerprinting requirements might be an obstacle for many. For some, even filling out the application form can be hard. Laura Lichter says the questions may seem simple. LICHTER: Your name. It asks for a mailing address. WANG: Pretty straightforward, it sounds like, questions you would kind of expect. LICHTER: You would, except that as an immigration lawyer, if you ask a question such as, when did you come in and how did you come in, that can actually be a difficult legal issue. WANG: Overall, Lichter sees the deferred action program as a clear success. Less clear is what's ahead in immigration reform debate in Congress. In the meantime, Lichter says her immigrant clients are watching and waiting. LICHTER: People are excited about the possibility for immigration reform, but they're not naive. WANG: Better the bird in hand, Lichter says, which in this case is deferred action. Hansi Lo Wang, NPR News. POST-BROADCAST CORRECTION: In the audio of this story, we incorrectly describe the Deferred Action for Childhood Arrivals program as resulting from an executive order. It was actually created through executive action. Transcript provided by NPR, Copyright NPR.